“Android sale desu desu! Cheapo cheapo games desu! Totemo yasui! DESU DESU! HONTO NI! ARKJKBJGGG!! !” Translation: Hey guys, Google’s Play Store is having another massive End of Season Sale, with very awesome games and apps running in the $1ish range. You can get some very awesome games from the likes of Square Enix’s Crystal Defenders; Gameloft’s NOVA 3 and Modern Combat 3 first person shooters; SwiftKey 3 Keyboard which is the bestest keyboard in all of eternity ever; and a bunch of other things like the Vignette camera app, Beautiful Widgets, and a bunch of other things we don’t really know (but seem cool if you’re into it). Most of the games are discounted 70-80 percent and land at a price of about PHP 40-50 per app/game. We think it’s a steal so grab ‘em up at the link here, or check out the list of apps and prices below. Crystal Defenders (PHP 53.19) – a tower defense game (we believe) from Squeenix. Insta-buy. 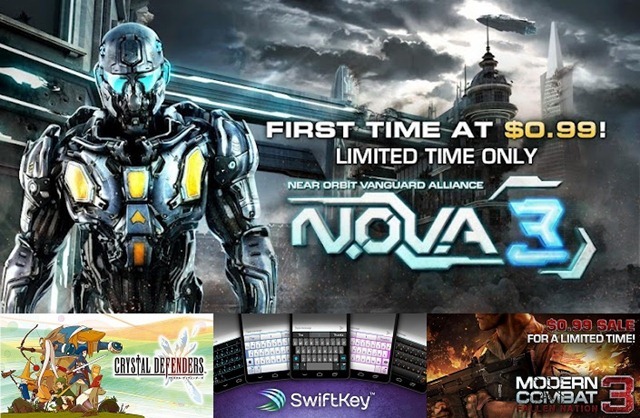 NOVA 3 (PHP 41.81) – Popular Halo-like game on Android. Bought it even if we don’t have a powerful phone to play it on. Zen Bound 2 (PHP 36.51) – Puzzle game where you try to untie a rope from a 3D shape. Looks interesting. Star Chart (PHP 46.09) – We bought this before at another sale. Probably not compelling enough for you guys to get, considering everything else in this list is way better. Super Dynamite Fishing Premium (PHP 36.51) – We dunno. A 2D fishing game it seems. Reviews look promising. Not sure if its our thang. Swiftkey 3 Keyboard (PHP 46.09) – Get. This. Keyboard. Now. Best investment you’ll ever have on virtual keys. Spirits (PHP 36.51) – What is this I don’t even… Yeah. Looks really awesome though; and it won a bunch of awards. And it looks like a Miyazaki movie. Go buy it if you like indie games like these. We did. iBlast Moki 2 (PHP 41.81) – The sequel to Googoo Majiquilk Attack 4! We dunno. Name is weird so we made fun of it. But the YouTube trailer makes it look like a physics puzzle game that actually looks awesome. Business Calendar (PHP 41.80) – Well, you businessman you. We know you’re busy so just buy this thing and we’ll leave you alone. Because you’re all serious businessy and stuff. Go back to your BlackBerry. HAH! Burn. Gangstar Rio: City of Saints (PHP 41.81) – This is a peaceful game where you build nice houses and decorate it with flowers. Or not. You know it’s a GTA-style game. Worth buying of course. The Lorax – Dr. Seuss (PHP 41.81) – Some sort of children’s book. ‘Cause yo’ kids got Android phones now. Virtua Tennis Challenge (PHP 41.81) – Iconic arcade Tennis game by Sega. Not a Tennis fan but hey, in this game if your score is zero its called LOVE! Vignette (PHP 46.09) – Camera app with filters. Now you can call random things too mainstream and be all like “I’m so much better than you.” Lol, ok that went too far. We’re gonna buy the app anyways. Modern Combat 3: Fallen Nation (PHP 41.81) – Are you OSCAR MIKE? Because we’re so OSCAR MIKE! GO GO GO! So yeah, it’s a modern FPS shooter. Go buy it. Beautiful Widgets (PHP 36.51) – The Widgets! They are Beautiful! Me Too! – Little Critter (PHP 41.81) – More children’s books for your Android-powered toddlers! And that’s about it for the list! Go buy them desu desu yo!